For some strange reason, after generously spending advertising dollars on the launch of its new broadband product called Dotmore, TelOne forgot to register the ‘dotmore.co.zw’ domain. It’s not just the unclaimed domain name; the TelOne website itself has no information whatsoever on the new product. Nothing. For an internet product you’d think having a web strategy as part of the branding process would make sense. The result: A lot of potential customers searching for more details about the product on the web (so they can hopefully buy) can’t find anything except this article, the one we did two weeks ago, and a not-so-positive review of their advertising campaign on Zim blog Bizsetupgroup.com. TelOne is not alone in this; there’s the highly successful low cost mobile phone brand G-Tide whose ‘gtide.co.zw’ and ‘g-tide.co.zw’ are both still not registered. There are many more examples than we can exhaust here of Zim companies and brands that have chosen to ignore their identity on the web completely. Luckily for TelOne, ZISPA’s terms and conditions will to an extent limit domain name speculators from registering the domain and parking it. Still, if someone can prove they owned the name (brand) before TelOne did, it’s a totally different case and TelOne may be faced with the unenviable situation of having to buy the domain at a much higher price or keep losing visitors (potential customers) to it. A few years ago when internet penetration was way lower, this was forgivable. Today, it’s a cardinal sin. yes just as in the case of Apple and “i” domains. Release it for free? Whaaat! This is where i give absolute respect to ZISPA who check on every domain registration that comes in, to make sure you don’t register a domain name which could potentially be someone elses ‘property’ unless you are authorised to do so. I think you should be allowed to register hotmail.co.zw. Just because MS is a giant Zispa can’t deny you not to register that domain. Plus if MS cared why haven’t they registered it all these years. I think that’s too much power in ZISPA’s hands Kalpesh. there’s need for some recognition of difference in territories and the scope of trademarks. what law does ZISPA use to deny the hotmail.co.zw reg? And no, I’m not for speculators registering a legal trademarks. I do agree, it can be very “control freak’ish” with ZISPA. Im not sure what law they use to determine registration.. i think perhaps ZISPA should be contacted for clarification…i dont see why they would not want to help clear an issue with domain registration queries… they are very reasonable people from what i’ve seen. personally, i agree with the interrogation of domain name registrations… and thats on my basis of lucrative domain buying/selling practices that i mentioned in the post below to masimba. i have met alot of people in my career who have had issues with people registering domain names “off the cuff”, and then hanging onto them..to get people to offer large sums of money for them. that is the reality of overseas domain names.. at least in Zimbabwe, there is some kind of order. I have no problem with regulation but I don’t think it’s ZISPA’s space. They shud facilitate registration, even automate. An separate body must then be setup to resolve disputes where they arise since it can be a complex area that requeres legal experts. If for instance I decide to register virgin.co.zw or boeing.co.zw shud ZISPA block me even if Boeing isn’t interested in eva using that domain in Zim? My argument is informed by the SA situation where registration is automated and almost instant. Disputes are logged at http://www.domaindisputes.co.za/ and decisions made public. 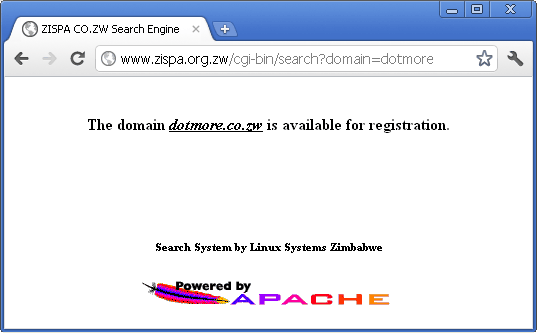 whereas, in Zimbabwe, from what i see, ZISPA have been delegated as the authority for domain registrations for co.zw. and this is their way of doing things. What i thought was really ironic, was that on the domaindisputes.co.za website, nearly all the domains like citroen.co.za and fifa.co.za were all ruled in favour of the giants. A really interesting story was the one about mixit.co.za getting challenged by MXit. apparently the dude had registered that domain even before mxit services began, and he lost that domain because it was parked. Cybersquatting is a real issue people…. and this is ZISPA’s way of preventing it. @kthaker:twitter , you can’t just “give absolute respect” to ZISPA coz they limit people registering domains. The important thing to know here is, how does ZISPA determine that a domain is “someone else’s property”? If it’s just ZISPA deciding based on them generally knowing that hotmail is owned by Microsoft then the determination is flawed. Not pushing for ZISPA letting anyone register any domain, but there should be a transparent procedure on how a domain is rejected. See, this is the problem… hotmail for example, is a registered trademark which legally is owned by another company. ZISPA are the authority for co.zw domains, and they have a huge responsibility is determining who registers a domain, and how it will be used. ZISPA actually do not limit people registering domains, they just have policies in place, that people need to follow. if you try and register a domain like hotmail.co.zw.. i know for sure, that they would contact you to find out who you are, and they would ask you questions about your application. depending on your answers, they would either allow it, or they would explain to you why you cannot register that domain…it is very transparent. you guys must remember that buying and selling of domain names is a huge (and potentially lucritive) business practice. alot of people, make alot of money registering domain names, and then selling them for large sums of money to people. say if someone tried registering a domain called zimbabwe-online.co.zw. i’m very sure you’d be hearing from ZOL if you had to advertise it in the public media. common sense tells you why that would happen. Zispa should either charge for this clause or let people register whatever domain name the want. That’s folly IMO. It’s the 3rd party’s responsibility to protect their intellectual property, and yes with the assistance of ZISPA, maybe thru some legal body setup to arbitrate in such matters. Does ZISPA for example allow me to register ihotmail.co.zw? Does it know for sure that MS is interested in that domain or will even have a problem with me registering it? It’s some obsession with control IMO. Brands don’t need their own domain names. Otherwise Coca-cola forgot to register cocacola.co.zw too… really, domain names have been superseded by Google. It could be telone.co.zw/dotmore or dotmore.telone.co.zw or http://www.telone.co.zw/?prod=dotmore&campaign=43cfs – what matters is people can find it (via Google). You’d be surprised the proportions of people who go to the address bar to type facebook.com vs. those who type ‘Facebook’ in the Google search box. As a search engine optimisation tool for the brand a domain name actually is quite powerful. Domain names still carry weight on search results, and for anyone searching for “dotmore” on Google, the http://www.dotmore.co.zw domain will be on top of the results. And if that user happens to be searching on google.co.zw (local Google domain), then dotmore.co.zw will surely be on top. If I were TelOne, I wouldn’t want to lose all that traffic to some parked domain or stories on the internet about my product. I agree, the domain name is one of the signals considered by the Google algorithm. But considering that 1)domain parking is illegal in Zim and 2)Telones dotmore page (if it exists) will probably have the highest page-rank for that search term (in .zw TLD), so there’s no pressing need for them to add another domain, IMHO. These brands/campaigns come and go. If they had a domain for each product they’ve launched over the years, it’d be a very long list. I agree with Tapiwa, TelOne didn’t really need to register a new domain just for their new product. Probably their mistake was to forget to publish it on their website. thanks for the comment @92c3b745cb1bf0602d23a5f71c2d5433:disqus. See my response to Tapiwa’s comment on why it’s important to register a domain for their new internet brand. Why would Telone need to register a .co.zw anyway. It is just a new product, not a new company. Beware of sensationalist reporting – look what happened to News Of the World !! Wow – at least @t_api_wa got it right. Any way what has this got to with the way domains are registered in Zim or anywhere else. Domains have become a VITAL part of the marketing mix guys. In some instances they are necessary and in others they’re not. In Dotmore’s case a domain and site is very important-this is because Dotmore is not just an online product, but an operating division of Telone. It is what you used to refer to as Comone. Telone operates along very simliar lines as South Africa’s Telkom. They are both parastatals and have a similar thrust. In this regard Dotmore’s equivalent is Do Broadband-please have a look at http://www.do.co.za and even checkout http://www.dobroadband.co.za . Why did Do register? The decade long economic blitz affected Zimbabwe’s development in this area, while domains and an effective online presence is highly important across the world, some locals don’t believe its important. In this age ICT people are not actually qualified to look into this. Marketers and brand builders are the ones responsible. A lot needs to be done locally and this onus is on our entrepreneurs to usher in this revolution. The space is wide open for people to look at things differently. An example of this is http://www.biglaw.co , they have turned the tables on traditional web design. We need more of this. I strongly agree! With so many users accessing the web with mobile fons, it just makes sense 2 point potential customers straight 2 the product. Subdomains & paths are clumsy & the easier you make the url the better for users & marketing pple. If telone had an aggressive & creative marketing team a domain wud hv bn a gud starting point..
A distinction must be made between IT , Graphic Design & Marketing. The problem is that too many self taught Joe Schmos who did a networking course, a pirated copy of Windows Xp and a Pentium 4 laptop with “Wi-Fi” are controlling the Zimbabwean industry armed with nothing but instinct and tutorials. They then blur the lines between these distinct professions and charge $50 for a random compilation of copied and pasted HTML forced into Joomla or WordPress. On the side Tindo who did O Level art and just so happened to teach himself how to incorrectly use CorelDraw and Photoshop sets up an office in room 301 Roseline House and feels that he can chat new frontiers for Design in Zimbabwe. When Tindo & Joe come together to form their little “TJ Zimsoft” company and ask uncle so & so in a big Company or Government to hook them up with tenders things like this happen.IT people must stay away from the front of websites. That’s a Job for Qualified designers under the guidance of Qualified Marketeers. Just program the back-end and leave it at that Dammit!!! your designs ARE UGLY! In turn designers must leave network cables, XP Black DVDs, Microsoft Visual Studio and screwdrivers alone GO COLOR A BOOK!!!. Can’t we live peacefully without the other guy trying to steal the other guy’s job while he blinks, this is not the GPA/GNU. As for Tindo & Joe, go back and finish school you are not Programmers or Graphic Designers, Sheish!! !In fact Techzim was a victim for some time with that old horrid Logo Tindo designed for them. Do you think gys who make faulty car tyres should be banned!?….. Take your time. i feel that the environment in zim has forced us young folk to have to be jacks of all trades as we had to leave the workforce to make ends meet. now to leave your job as an account exec at an ad agency and start your own company with a minimal budget, you would have to take on the role of designer as well, and when someone asks for a website you would then combine your new design skills with majoomla tutorials and present them with a site, as a result you are now doing three jobs in one, kind of spreading yourself thin, but to make ends meet. Unfortunately the old heads in the corporate world still hold their marketing and IT positions, which in a normal economy, would entail either keeping up with international trends or losing your job, but because we are here in zim they rest on their laurels knowing that there is no threat and stick to ancient formuli.